It seems certain that the first Mass to be celebrated in Bathurst, was said by the famous pioneer priest Fr John Joseph Therry on 1st or 2nd November 1830, when he was called from Sydney to attend the execution of a convict, Ralf Entwistle. In those days, Bathurst was “the remotest part of the colony” and Mass was likely said in a room over a stable at an inn at Kelso. However, it does appear that Catholic laymen had begun some form of worship by 1824 (just 11 years after the crossing of the Blue Mountains). Three years later, an English Benedictine, Dr William Ullathorne visited the town and four years after that Fr Lovat stopped at the settlement for a few days. In July 1838, the Reverend Fathers Michael O’Reilly and Thomas Slattery arrived from Ireland and were appointed to Bathurst, now established as a new church district. They attended 26 stations including Mt Victoria, Mudgee, Wellington, Dubbo and Bathurst. There was no church and Mass was probably celebrated in the courthouse at first. A small hut in lower Durham Street was later used for a short time as a temporary chapel. Towards the end of 1839 work was commenced on the parish church situated on the corner of George and Keppel Streets – St. Michael’s. 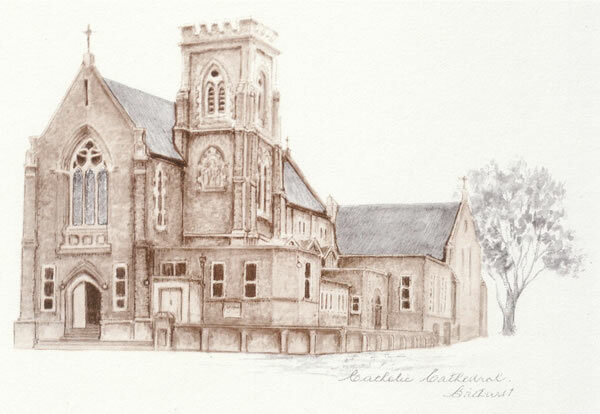 The Parish of Bathurst was created in 1839 and St. Michael’s was opened for worship in the middle of 1841, though its building was not completed for a further two years. After about 10 years, subsidence made it unfit for public worship, though it was used as a school for a number of years! By 1853, Catholic schools in Bathurst had a roll call of 90 boys and 130 girls. Arriving that year, Dean Grant was to devote eight years of his life to the building and development of the Catholic Church in the Bathurst district and it was his responsibility to raise the funds needed for the proposed new cathedral. In 1857, the foundation stone of St. Michael and St. John’s Cathedral was blessed by the Archbishop of Sydney, Dr John Polding, with the blessing and opening in April 1861.